Another one of my favorite pets, this is my favorite out of the Infernal Demon pets. Both in looks and in ability/breed table. Plus its Hellfire animation is nice too. I have a P/P, H/H and P/S and they all have their own uses, like another poster also mentioned. Although it usually doesnt make its way into my best teams, but its still useful enough in casual PvE battles. Went to Deadwind today to grind some pets using Arcane Eye. They weren't there, and I had nothing else to do, so on a whim decided to try soloing Kharazan knowing absolutely nothing about it save vague stories about Opera and Chess. I made it through handily and at the end was rewarded with this little guy that I didn't even know existed until I looted. Oh, and today was my birthday. I'm surprised how every breed of this pet has a use. If you want him for Explode - you need a H/H; if you're thinking about Nether Gate - you have to pick P/S (since S/S isn't available... the 281 speed still works fine, there are plenty of slower pets in PvP); and if you just want a hard hitter with Crush and Meteor Strike - you take the P/P. I love this little guy, though I'm still trying to decide a good name for him. How does he stack up against Minfernal, though? 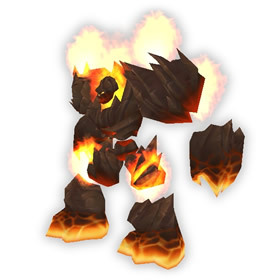 First off, this pet is big, and it has an awesome helfire animation, which it does fairly often. If you really want to have some fun with it, go to the Darkmoon fair, and when the Warchiefs play their concert, if you come from the very back of the stage sticking close to the side and stand right up against the front of the stage, it will run up onto the stage and stand at the front like a boss, and probably start helfireing part way through the song. Netherspace Abyssal=Metal! After running Kara on 7 toons two weeks in a row with only 3 pets drops total (everything but this bugger), I decided to just buy this one. I mean seriously, I had the MOUNT drop and not this thing -_-. Got a P/P breed from the ah though, which is what I wanted anyway. So to those of you still farming this little bugger good luck. If given some time this little Abyssal will start to channel a hellfire-like spell, just like the larger ones summoned by Prince Malchezaar during his fight. I made four runs through Kara. Three were met with the Wizard of Oz fight and the last got Red Riding Hood. First toon lost at chess four times, the following two wiped once each. No pets dropped at all. Then the last toon got the Lil'wolf off of the big wolf. I lost at chess twice and got the Abyssal for my troubles. Woot. 1) It is NOT a 100% drop.... obviously. 2) It has nothing to do with how many times you wipe on chess. It's complete RNG like every other drop ._. For anyone that truly wants proof I can say on my priest I solo'd chess, no pet. On my shaman it took two tries, still no pet. I got it on my tenth run through with an alt yay me. I did one shot chess with no wipes on the runthrough I got mine emptyelegy. Got it on the first try was so happy after giving up on the chest event the other day. It is a tall pet and when it sends out waves of flames, it is hard to miss. Glad to have it. Apparently having some bad luck. Ran through twice with two different toons and not a single pet drop from Kara. Fingers crossed as I gear up to go a third time. Update: Finally the Abyssal is mine! Dropped on my 8th run through. Worth the grind! Good Luck and Happy Hunting everyone! 10+ attempts on the Chess event and fortunately the pet dropped for me on the first Malchezaar kill. Kara is a normal-only raid; no heroic version available. This solo guide http://us.battle.net/wow/en/forum/topic/7416264533 for the chess event worked for me on my first try. The pet dropped! Just dropped for a guildmate of mine! Go Sarwhin! OK read a bit and solo'd chess event last night. Took about 4 tries. You have to be quick with your moves or sometimes the horde pieces are right up in front of the pawns and you can't move them. No pet dropped off last boss. Guess I need to do this again next week! Out of all the raids got 2 pets to drop (Couldn't finish Vashj though) so 2 out of a possible 9 for me. Just got mine first run though. Havent Lvled it up yet, but it looks like it will be a nice force swap your enemys pet. First run of the day through kara, no other pets dropped so was greatful that he dropped off the last boss.. No more chess event when I run through on all my alts :3 10 more timest today hopefully more pets drop!